Russell Wiley is struggling. His career as a media executive for a paper based newspaper in the new technological age is in jeopardy. When his scheming boss hires a hot shot consultant to develop a plan Russell knows is doomed to fail, he waits for the axe to fall. To make matters worse, Russell's personal life is also suffering. His wife is pulling away and his marriage becoming increasingly sexless, he struggles against the female presence in his office. With his life in danger of falling apart around him, will he figure out how to save himself? 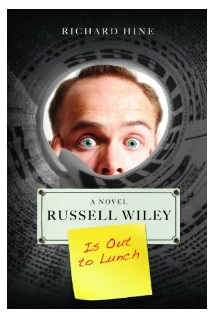 Russell Wiley is Out to Lunch is full of office politics, procrastination, passing the buck, workplace monotony, and keeping the status quo, and didn't just revolve around his office, but Russell's life at home where his wife is growing more distant. This novel was easy to read, frequently funny and I really enjoyed everything from Russell's character to the story. Hine's character creation from a few simple scenes was fantastic. The empathy I felt for Russell from the very first scene stayed with me throughout the novel. I could relate to his being stuck and not moving forward and rooted for him to figure things out. His inability to take action had me wanting to shake him at times though and I had hoped he would figure out a few things on his own, rather than just reacting to what was thrown at him. The end wasn't predictable in certain aspects and had me smiling as did much of the novels with Russell's wry observations of his situation. I've only been a minion in an office and never in management, but still enjoyed this book. It was interesting to have an inside view of how management can bumble things up and go with the safe route and I think anyone who has been stuck in an office will be able to relate to this novel. Unfortunately I had a difficult time keeping track of Russell's co-workers. They moved in and out and at times I struggled to recall who they were when they reappeared. I had also hoped Russell would help his employee, Angela, more but think this was part of his character in that he wasn't entirely comfortable with the situation, and even with himself enough to do more to assist her. But I still found it disappointing it wasn't addressed further. This novel was quoted on the back cover as being similar to Sophie Kinsella, but I just couldn't see this connection. There was humour in this story, and Russell's character is slightly bumbling and lacks a self confidence I've discovered in Kinsella's novels, but just didn't find it compared, so don't expect a male Becky Bloomwood here. Instead, you'll find something more akin to Office Space or The Office, equally satirical and humorous with it's observations of office politics. Overall, I really enjoyed Russell Wiley is Out to Lunch, finding it easy to read with laugh our loud moments and an interesting premise. I look forward to more by Richard Hine. Russell Wiley is likeable, which is possibly the most important aspect of this novel. That and Richard Hine’s ability to write about a job at a newspaper office and have it be light, interesting and funny! I loved this book from start to finish. I loved that Russell’s wife refused to sleep with him (for so long he was counting the days!) and obviously didn’t like him much and I loved that he was just sort of waiting to see if she would, at some point, get any nicer? He’s obviously one of the good guys and this wasn’t just shown by his relationship with his wife but also with his staff on the paper. I never thought of him as pathetic or downtrodden rather he was ever hopeful that things would turn out better. He guided his staff with thoughtfulness and respect (where deserved) and should be everyone’s boss. Unfortunately although optimistic, Russell also isn’t stupid and even he eventually had to accept that his wife wasn’t suddenly going to love him and his boss wasn’t ever going to actually have a good plan- ever. But that’s what made the novel realistic. Almost the entire plot is set at the newspaper and it wasn’t ever dull, there were believable details about all the staff and great care was taken to ensure that the reader new each one individually. Hine writes brilliantly and I laughed many times. I was happy about the conclusion too - I hate being left with dangling plots!